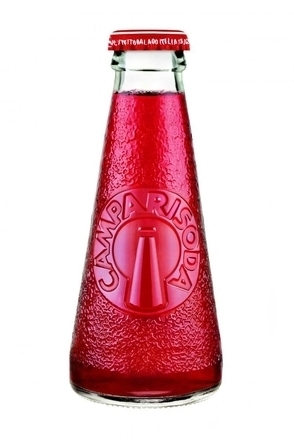 Launched in 1932, Campari Soda was an early forerunner of the RTD (read-to-drink), or alcopop, and is one of few pre-packaged cocktails to last the distance. This premixed cocktail comprises one part Campari to two parts soda. Designed in 1929 by the Italian Art Deco and futurist designer, Fortunato Depero, Campari and Soda is packaged in a unique cone shaped 10cl glass bottle, with it’s branding confined to embossing on the glass and typography on the crown cap. Clear, crimson red with small bubbles and a ring of foam around the glass. Blood orange peel, orange sherbet, grapefruit, cherry and lemon thyme. Herbaceous quinine bitterness and refreshing carbon dioxide effervescence with blood orange zest, zesty grapefruit, rich cherry and faint vanilla cream-of-soda. Long dry finish with orange pith bitterness, sweet cherry and vanilla. Campari and soda is one of the most revered combinations of liquids to ever come together in a bar. However, due to its dry bitterness it is a polarising one. If not initially to your taste then persevere, and if you finish the bottle and you’re still not a convert then mix yourself a Campari & Tonic. Launched in 1932, Campari Soda was an early forerunner of the RTD (read-to-drink), or alcopop, and is one of few pre-packaged cocktails to last the distance.